How are we doing? Give us Feedback! With our weekly drop-in groups you may come as often as you like-- every once in a while or weekly. No need to sign up, just show up! New members are always welcome. We hope you will join us. This is a harm reduction group which provides a safe, supportive and non-judgmental environment to discuss your relationship with alcohol and drugs. Abstinence is not required. You may attend this group as often as you like-- every once in a while or weekly. Contact Ned Peck LCSW at (707)826-3236 if you have questions. Best of You is a support group which will help students improve their ability to form and maintain relationships with friends, family, and others. Students will have the opportunity to meet new people and learn new skills while enjoying fun activities like playing games and watching videos. Feel free to bring and eat your lunch during this group. No need to sign up, just show up! Contact Kelsi at 707-826-3236 if you wish to learn more about this group! Café con Chisme is an open/drop-in meeting to sit together and enjoy a hot drink with pan dulce while discussing diverse topics that range from current events, campus issues, and personal/professional development. All the while sharing stories of health and well-being. This discussion group is hosted by the LatinX center. It is so much fun, CAPS wanted to be a part of it! Depression can be a tricky beast that often lures us away from the exact things that can help us feel better and live our lives more fully. Thankfully, depression has been a topic of conversation, art, and research for centuries, which has led to a lot of useful tips, tricks, and techniques. This group is a dynamic, informal, and creative place to learn effective and fun ways to beat depression and live a more vital and fulfilled life. Whether you've been feeling blue, are in a rut, or have been feeling depressed, this group is for you. This is a group for those living with a chronic health condition such as chronic pain, diabetes, IBS/IBD, heart disease, COPD, etc. You will learn better ways to cope with your condition including goal-setting, activity pacing, and relaxation training. You will also gain support from peers dealing with similar issues. Please contact Elizabeth McCallion, Ph.D. at eam162@humboldt.edu if you would like additional information or have any questions. Mindfulness and meditation can help us take things "one breath at a time." Interested in learning some basic mindfulness meditation skills and practicing those in a supportive setting? Mindfulness meditation can help you reduce stress in your life, stabilize your mood, improve your sleep, improve your communication and relationships, treat yourself and others with more compassion, and enhance your attention, concentration, and memory. Each session consists of a supportive discussion about our mediation practices over the past week, a 20-minute guided mindfulness meditation exercise (usually a different one each week), and a discussion of how the meditation went. Students, staff, faculty, and all levels of experience are welcome. This is an open group designed to provide students with the opportunity to discuss and share their experiences as students in the African American community, as well as on campus, in order to develop continued support and unity. This discussion group emphasizing confidentiality, positive regard, and respect for all. This discussion group is a collaborative venture with the AACAE. A group inclusive of all gender identities where people can get support, explore gender, and advocate for change on campus. This is a group for HSU Veterans to gain support in navigating the unique challenges of being both a Veteran and HSU student. Please contact Elizabeth McCallion, Ph.D. at eam162@humboldt.edu if you would like additional information or have any questions. This weekly drop-in group will help you learn how to support each other while learning, to better manage stress, process emotions, enhance reliliencey and develop adaptive coping skills. Each week’s session will be in two parts: 1:30-2:15pm; Learning a new skills (topics change each week), and 2:30pm-3:00pm solution focused support group. 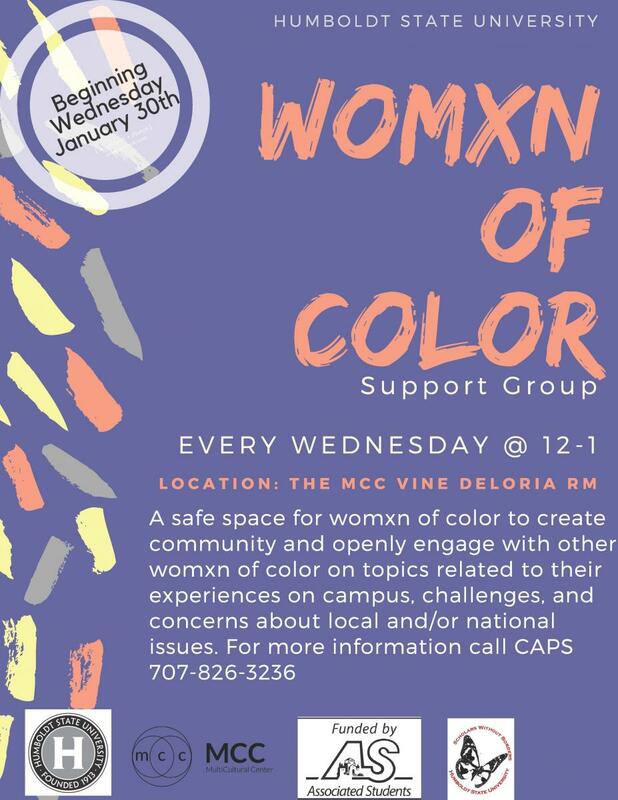 A safe space for womxn of color to create community and openly engage with other womxn of color on topics related to their experiences on campus, challenges, and concerns about local and/or national issues. This group is a collaborative effort with the Multicultural Center.